See Kourtney Kardashian Embarrass Sister Kim With a Flash Mob on KUWTK: "What the F--k Is Going on?" The Kardashian sisters are the queens of pranks and this time, the joke's on Kim Kardashian! In this clip from Sunday's all-new Keeping Up With the Kardashians, Kourtney Kardashian decides to embarrass her sister by performing a flash mob dance while out at a local mall with pregnant sister Khloe Kardashian. "What the f--k is going on?" a shocked Kim asks when she sees the dancers. It's not long before Kim spots Kourt dancing alongside Khloe's bestie Malika Haqqamongst the group of professional flash mob dancers. "Don't tell me you know it too," Kim says as Khloe jumps in line with the dancers. 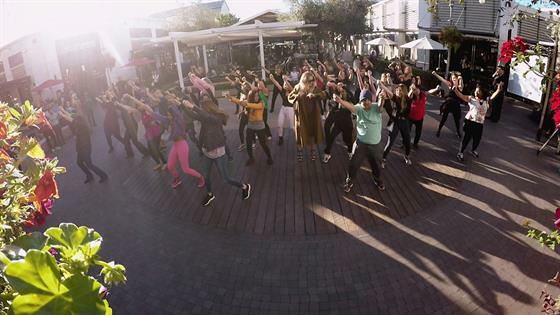 "I'm literally dying inside over this flash mob," Kim confesses to the camera. "I just can't even believe you guys. I'm gonna have to run if they try to pull me into this." Luckily for Kourtney and Khloe, Kim is a good sport. In fact, she's nearly moved to tears of laughter over the impressive surprise. "You played this one off really well," Kim applauds Khloe. Even with their recent feuding, Kim can't help but pat Kourtney on the back for this one. "After you ruined our dance class with your critiques, I thought it would be funny to embarrass you. Did I succeed?" Kourtney asks Kim. "You did," Kim admits.